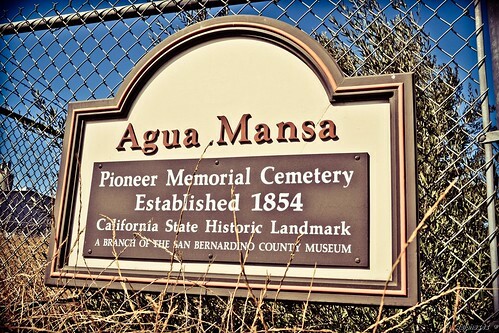 Today, the Agua Mansa cemetery is the last visible remnant of the first Catholic community in the Inland Empire. The original settlers for the Agua Mansa community came from Abiquiu, New Mexico in 1842. They built their homes on the side of the Santa Ana River in today's south Colton. The cemetery was developed on the bluff behind the church to avoid any possible damage from the flood plain of the river. Burials in this cemetery began after the new parish, San Salvador de Jurupa was begun in 1852. The first recorded burial was on May 26, 1854. The last burial was in 1963. With no official records available, estimates done by several individuals indicate approximately 500 burials were done over the 110 years. In 1867, San Salvador parish became a mission of St. Bernardine Church in San Bernardino. Rev. P.J. Stockman, pastor at St. Bernardine Church, acquired the title to the cemetery in the 1880's. The Diocese of Monterey-Los Angeles (1853-1922) viewed the cemetery as a parish facility and thus had no responsibility for its maintenance. Fr. Stockman gave his title to a commission of three trustees for the cemetery. However, upon their deaths there was no one left to supervise the cemetery. Fortunately, Mrs. Marie Espinosa Wood of Riverside, a descendant of two of the original families, formed in 1955 the "Friends for the Preservation of the Agua Mansa Cemetery." After many years of dedicated determination, Mrs. Wood convinced the San Bernardino County Board of Supervisors in 1968 to preserve the cemetery as a historical site. The grounds were later designated as California State Historical Landmark #121 and today is administered by the San Bernardino County Museum.